The Viginia State Chapter hosts regular bimonthly meetings at restaurant locations in the Greater Richmond Area. The meetings draw Chapter members and spouses from all parts of Virginia (and occasionally from outside the Commonwealth). 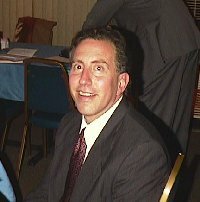 The VSC met on May 15, 1999 at Milepost 5 Seafood Restaurant in "The Crow's Nest." This is one of our favorite haunts, with an ideal meeting room and great service from the staff. The VSC met on March 13, 1999 at Candela's Pizzaria & Restuarante Italiano with 19 present. Highlights included generous donations to the VSC Educational fund by Colenel Ray and Anne Miller and News from Graham Rollings of the continuing efforts to institute the issue of Airborne license plates from the Virgnina Department of Motor Vehicles. *If you are an inactive member or have yet to join the Virginia State Chapter, consider yourself invited. Return here for details, including meeting locations and times. Don't forget to RSVP! 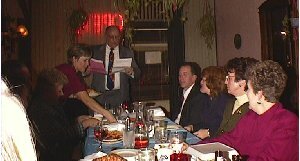 Our November, 1997 meeting was held at Dina's Greek Restaurant in Midlothian. After an outstanding meal, Jerry Getzel, Volunteer Coordinator of MgGuire VA Medical Center, spoke to the group abput the many services offered by the VA. A contingent from the Virginia State Chapter visited the VA hospital on Veterans Day and distributed prepaid phone cards to patients on the spinal ward. During the meeting the Chapter resolved to make it an annual event. For details about the installation of 1998 Chapter officers, please see Chapter News. We were honored to have Jerry Getzel of McGuire VA Medical Center as our guest speaker at our November 15th meeting.